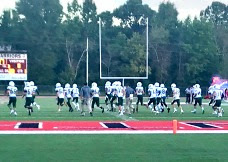 The MCC Varsity Football team traveled last weekend to take on Corinth High School in Mississippi. The action packed four day trip began with VIP treatment from the coaches and team at the University of Alabama at Birmingham (UAB). 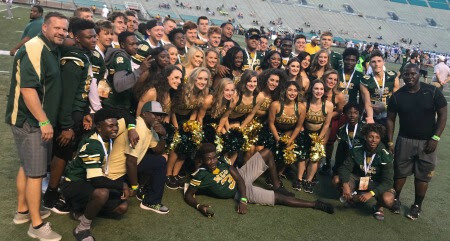 Our boys enjoyed a special pregame meal at the stadium then shared the sidelines with the UAB Blazers. 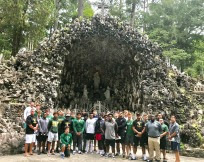 The next day they visited the beautiful Ave Maria Grotto, in Cullman, Alabama. This is a 4-acre park in an old quarry on the grounds of St. Bernard Abbey. It features 125 miniature reproductions of some of the most famous historic buildings and shrines of the world. Next they traveled to Corinth to compete against the Warriors. The Hustlers played well. They started things early and jumped out to a 17-0 lead only to see victory slip away. The night ended with a wonderful postgame meal with the Corinth team. On Saturday, they journeyed to Memphis to visit the National Civil Rights Museum and join the University of Memphis Tigers for an on field experience and cheer them on as they played Mercer at the Liberty Bowl. After that it was time to come home! These young men represented MCC very well. Throughout the trip, many praised our boys for being so courteous and well behaved. You make us proud!